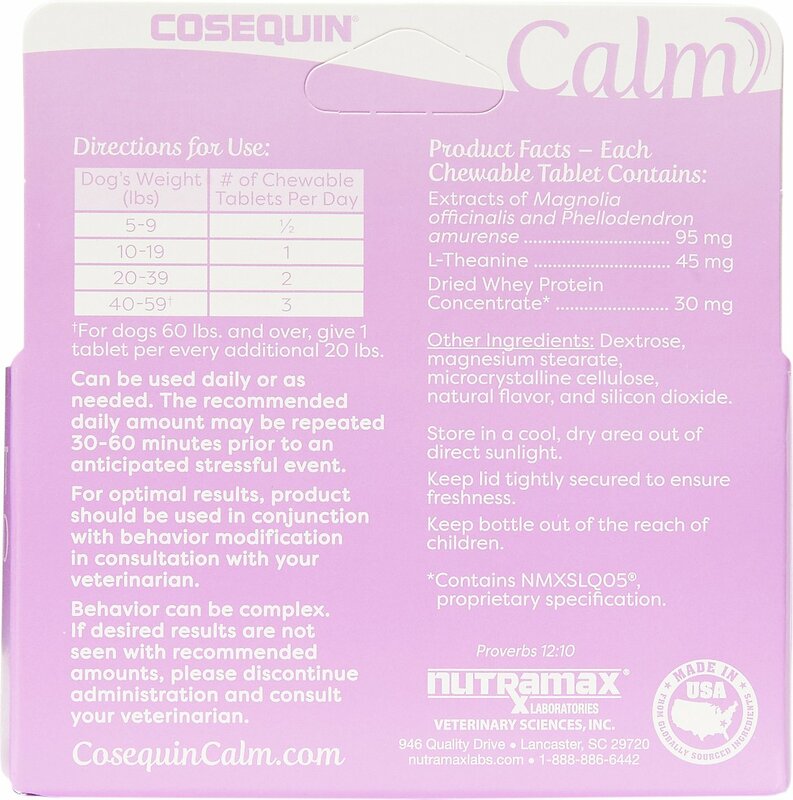 Because dogs don’t know how to take a deep breath, the Nutramax Cosequin Calm Chewable Dog Supplements is the next best thing. 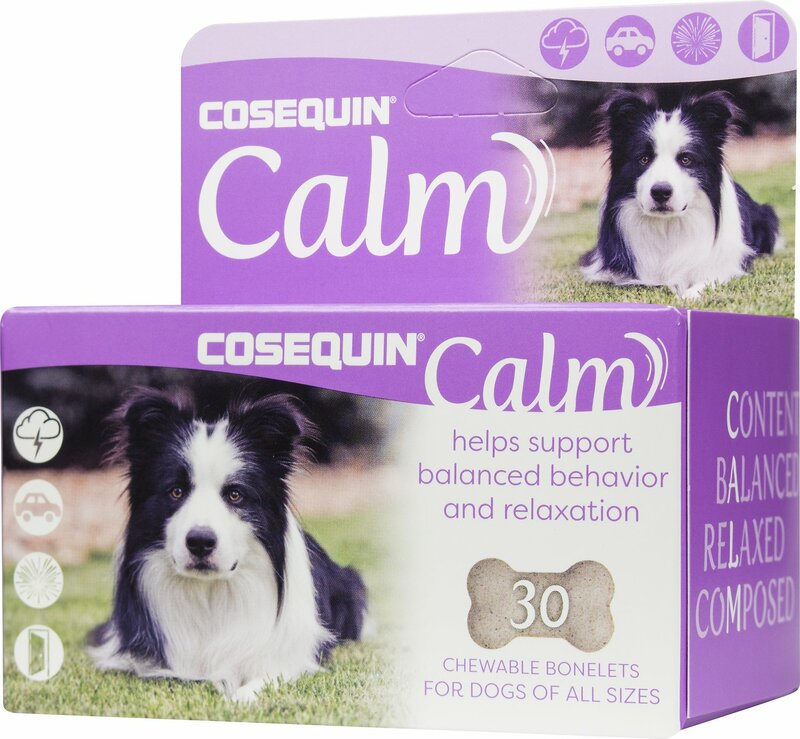 Designed to help support balanced behavior and relaxation in dogs of all size, the combination of key ingredients facilitates a calming effect. It’s ideal for dogs that show signs of fear and anxiety in situations like thunderstorms, travel, loud noise and visitors. 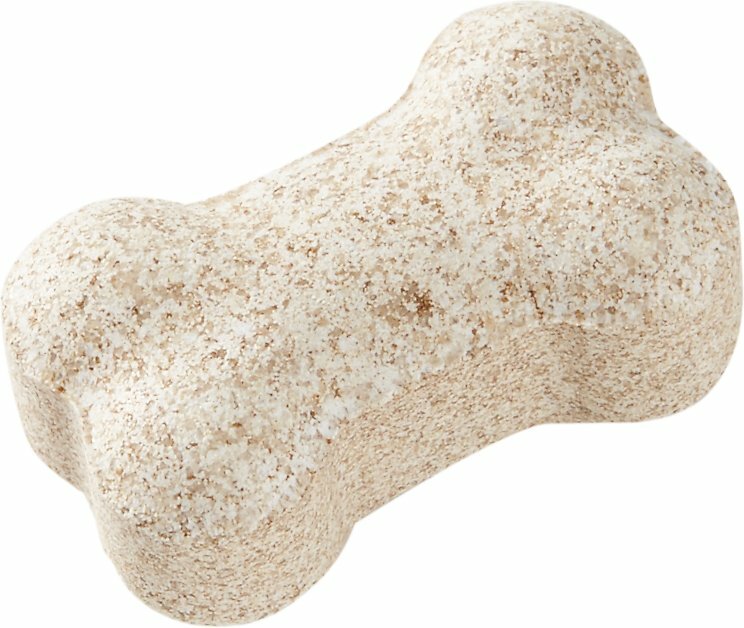 Plus, they come in a bone-shaped, chewable tablet with a tasty flavor that dogs will think is a treat. 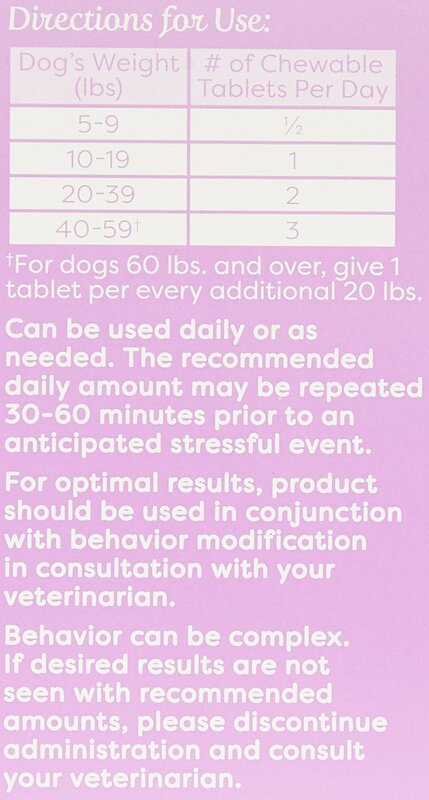 Chewable supplement supports balanced behavior and relaxation in dogs of all sizes. 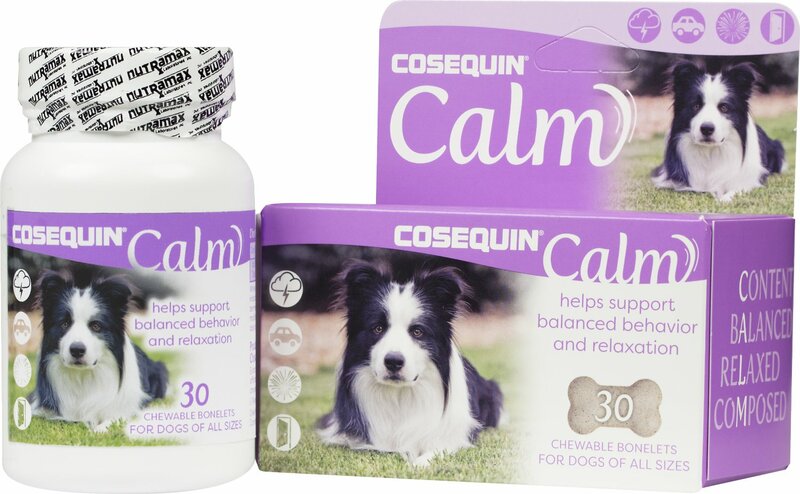 Calms dogs during stressful situations like thunderstorms, visitors, travel and loud noises. Helps to alleviate common signs of anxiety like trembling, panting, hiding, escaping and excessive barking. Contains the key ingredients of L-theanine, magnolia & phellodendron extracts and whey protein concentrate. Can be used daily or as needed, in a tasty and chewable form that dogs will think is a treat. Store in a cool, dry area out of direct sunlight. Keep lid tightly secured to ensure freshness. Keep out of reach of children. Leo can get very nervous during long car rides because he threw up during a windy road trip as a puppy. I've been thinking about using a supplement like this for some time now. My Vet also recommended one but I was trying to correct the issue through training. When that failed, I gave in and tried Nutramax and it worked. By taking a tablet an hour before car rides, Leo was less anxious and calmer. I think I'll use this before long road trips instead of leaving my furry pal behind on our weekend adventures. She seems to get a little anxious when we are all gone from the house. She seems to chew on items that aren't intended to be chewed on :). 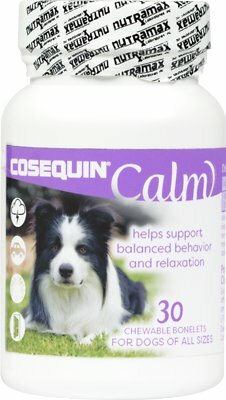 We have been giving her 3 of the Nutramx Cosequin Calm Chewable Tablets and she seems to do much better. (no more chewing on end tables and such, lol) We do have to sneak the bones to her in bread,she doesn't just swallow them without being enticed. That's OK though! I’ve been using the supplement with my morkie and it seems to be helping. He is a crazy dog and gets overly excited easily. He is still excited but I think it’s working. It did not seem to calm my yorkie down when I took her to groomer. I was hoping it was stop her anixety. She loves to get in vehicle but is extremely hyper when we go anywhere. I didn’t work... my Boston Terrier still very anxious :(.. I will keep looking for a different natural and safe approach. Works but dog HATES taste! I'd have given a 5 star review but I really have to twist his paw to get him to take it. Please work on the taste. Worked but dog did not like taste at all!! I think during the thunderstorm these tablets did help. However, the bad part is I had to coax and coax and coax to get her to eat them... she usually eats anything and she wanted no part of the tablets. For her size I had to give her 2 and it was not too easy. She finally ate them and she did seem to be sleepy after a bit. 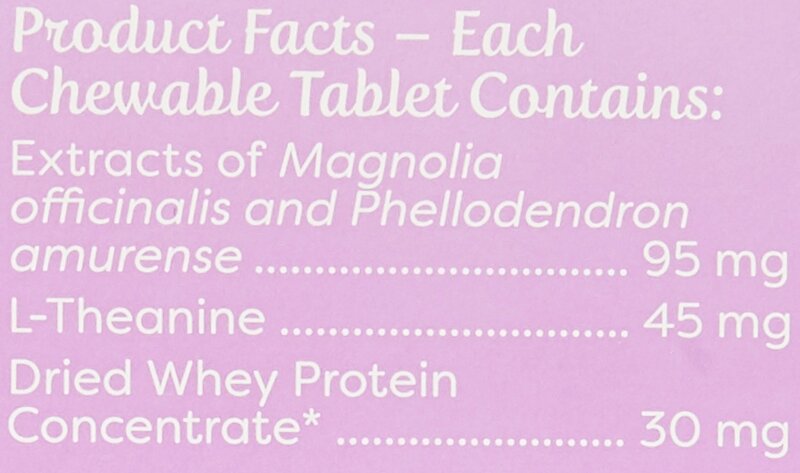 Tablets have not made any difference for my Aussies . I was really hoping they would but no! Wonderful company - I am very happy with everything I have bought.